It’s no secret that the Barrelhouse Editorial Squadron loves literary journals. However, we also love books, so we decided to start publishing them. No, Bring the Noise: The Best Pop Culture Essays from Barrelhouse wasn’t a fluke. We’re in the book publishing game for real. Barrelhouse Books looks for engaging, dynamic works of fiction, poetry, and nonfiction. We publish smart, insightful novels and short story collections that are complex without being obtuse; the kind of stuff your intelligent, non-reader friends will love as much as your MFA classmates. Here’s a discussion between Books Editor Mike Ingram and Assistant Books Editor Lilly Dancyger, which will give you some idea of who Mike and Lilly are and what they’re looking for in our next Barrelhouse book (submissions open January 1, 2019). “Consider this my suicide note. As I write these words by candlelight, in a location I cannot mention, I do not fear for my future. I understand that I have no future. My only fear is that what happened here will one day be forgotten. The narrator of Year 14 was a young man when a revolution changed his homeland forever—a new regime, a new calendar, a new flag, a new anthem and new money. Thirteen years later he has a comfortable job as an editor for the state-sanctioned newspaper, a loving wife, and an unswerving belief in the benevolence of his country’s Caring Leaders. But when a new Information Gatherer is assigned to the newsroom—a peculiar man-child named Tup-Tup, the son of an important government minister—he’s forced to face the truth about his sacred homeland. Year 14 is a comedy, a tragedy, and a cautionary tale. By turns frightening and absurdly funny, this timeless novel offers a hopeful, if hard-won, affirmation of humanity’s indomitable spirit. Growing up in an eccentric North Carolina home, with aging-hippie parents whose marriage was forever crumbling around her, author Sarah Sweeney was primed for trouble. For drugs and boys. For learning about sexuality from Madonna videos and prank calling teachers and meeting celebrities—including a young Adrian Grenier. For a father’s supposed alien abduction. For escaping the South and even her own family. 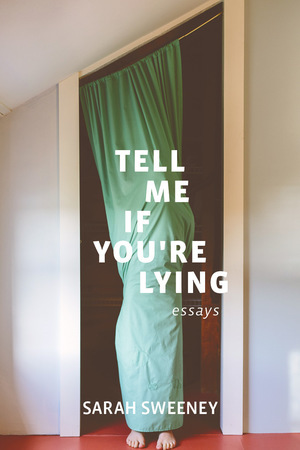 Funny, exuberant, and often heartbreaking, Tell Me If You’re Lying examines the lies we’re told as children and the downright unbelievable—but true—stories that comprise Sweeney’s colorful coming-of-age. What happens when you take something like a pop song and turn it in on itself, give it a different relevance or frame of reference, juxtapose the work against itself, against other pop music, bring it into the present, experience it in a different way? This book is a new revising of the confessional. It's about having to grow up, about those feelings we want to get back to, the people we want to get back, the people we’ve had to let go. Humor, love, and responsibility. Selected from among the nearly 400 manuscripts submitted to our open reading period, each poem in daryl hall is my boyfriendtakes its title from a line of a Hall & Oates song. The poems here are not “about” Hall and Oates songs or what they “mean,” but rather what is triggered when listening to or thinking about the music, those feelings, experiences, and memories, that specific nostalgia attached only to the sort of pop music Hall and Oates created. The poems in You’re Going To Miss Me When You’re Bored integrate the sublime and the mundane, the destined and the happenstance, the dire meaningfulness of the moment and the absurd lack of consequence in the infinity. In some, the trivial becomes transcendent and in others, the transcendent turns out to be a mirage. Justin Marks treats both moments with equity, qualifying epiphanies and salvaging disappointments. Marks confesses to “not seeing what’s here / for amazement that it exists,” but for the reader, what’s here is exhilarating. Each poem feels like a realer version of a reality show, and everything buzzes with a sense of possibility or precariousness, “the ant [he’s] about / to flick from [his] foot” or the fact that he “saw a femur once.” What pervades this book is the feeling that, at any second, we too could see a femur. Thanks and Sorry and Good Luck: Rejection Letters from the Eyeshot Outbox compiles a dozen years of disappointment transmitted via e-mail from a single editor to hundreds of writers around the world. Performative and funny one minute, respectful and constructive the next, these rejections both serve as entertaining writing tips (suitable for use in today’s more adventuresome creative writing classrooms) and suggest a skewed story about a boy and his seminal semi-literary website, Eyeshot.net, which Lee Klein founded in 1999. What started as a lark—sending playful rejection notes to writers who’d submitted work for the site—over ten years took on a life of its own, becoming an outlet for Klein to meditate on his aesthetic preferences, the purpose of literature, and the space between the ideal and the real. Barrelhouse's first chapbook is "Philadelphia” by Gina Myers. This long poem is full of grit, hope, and pragmatic realism. What we love about Gina’s work is that it showcases a sharp, lyrical take on the world--from interactions at work to street harassment to the Black Lives Matter movement. The poem circles around the questions that lie at its center - What does it mean to navigate a new city? What does it mean to try to feel at home? When there are so many reasons to leave, why stay? Letterpressed by Friedrich Kerksieck/Small Fires Press, hand-sewn. Cover art by Emma Fick. Over the past decade, readers have learned to count on Barrelhouse to publish inventive, irreverent essays by authors exploring the ways their lives have been shaped by their pop culture obsessions. Bring the Noise is a collection of the magazine’s greatest hits, plus five new pieces produced exclusively for this anthology. Inside, a roster of accomplished and respected authors grapples with a wide range of topics, including Thin Lizzy, dive bars, Barry Bonds, Bob Dylan’s beard, pro wrestling, The Hills, roller derby, Adrian Grenier, and Magnum, P.I. Passionate, insightful, and funny, this collection is simultaneously a celebration and a critical dissection of the ways in which pop culture affects us all.